GREENSBORO - Former Lions defensive lineman Se’von Pittman (6’3”, 269) has signed with the Cobras for the 2019 season. Going into his second year as a pro, Pittman made his rookie debut last season with the Columbus Lions, playing in eight games, including two in the playoffs. Pittman produced 8.5 tackles in his time with the Lions. “I’m excited to get [to Carolina] and bring another championship back to the Cobras,” Pittman says on his signing. 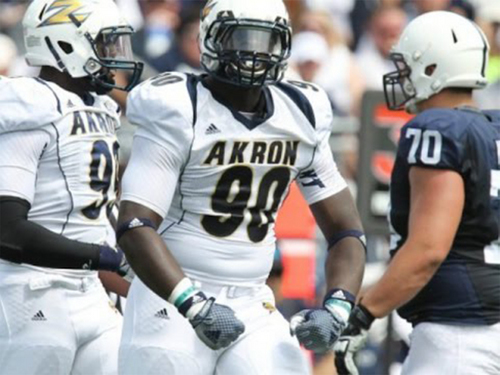 Prior to his professional career, Pittman played college football for the Akron Zips, where he compiled a total of 97 tackles, 14.5 of which for loss, four sacks, and two forced fumbles in his 36 games played. Pittman originally committed and attended The Ohio State University, but did not see the field after suffering a knee injury his freshman year. Pittman is a Canton, Ohio, native and attended High School at Canton McKinley High School. The Carolina Cobras are members of the National Arena League (NAL). Founded in 2017, the Carolina Cobras are starting their second season in 2019 and were the 2018 National Arena League Champions. The Cobras play their home games at the Greensboro Coliseum. Cobra Season Ticket Memberships are on sale now call (336) 445-7232 or visit carcobras.com. Follow the Cobras on Facebook at facebook.com/carcobras, twitter.com/carcobras and instagram.com/carcobras. The National Arena League was founded in 2016 and hosted its inaugural season in 2017 as the premier league in arena football. The National Arena League will kick off its third season in 2019. For more information regarding expansion opportunities or partnerships, contact Commissioner Chris Siegfried at chris@nationalarenaleague.com or Expansion Chairman Jeff Bouchy at jeff@nationalarenaleague.com. For more information about the NAL visit www.nationalarenaleague.com, facebook.com/nationalarenaleauge, twitter.com/NALfootball, Instagram.com/natiionalarenaleague.